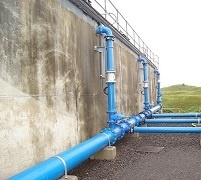 When stormy weather, increased land use and climate change increased THM levels, Scottish Water looked into investing in new water quality tools. Scottish Water initially tried bubble aeration for THM removal, but was disappointed by the marginal results. After meeting PAX, they decided to install a TRS spray aeration system in a large concrete reservoir. While initial results were promising, Scottish Water knew the toughest test would come in winter. But despite an “unusually difficult winter,” and higher TOC levels, TRS kept THMs low with 47% removal.